What is the Excepted quantities provision? When certain dangerous goods are shipped in very small quantities they can be freed from the stringent dangerous goods regulations by using the Excepted Quantities provision. This means that the package may be identified with an Excepted Quantities Label (Excepted Quantity Mark) and not labelled as per the strict requirements of the hazard class of the goods. The Excepted Quantities provision is similar to the Limited Quantity provision in that it gives consignors a legal and economically beneficial alternative for transporting dangerous goods, such as laboratory samples and perfumes, in very small amounts. The maximum amount of dangerous goods allowable within each inner packaging, and complete package, varies greatly depending on the type of goods and the shipping transport mode. You can find the allowable amount in the relevant regulations (IATA, ADR and IMDG). All modes set a maximum of 1000 packages per transport unit. As with Limited Quantities, not all dangerous goods are permitted to be shipped under this provision. To ship a hazardous material under the Excepted Quantities provision you must first determine its Proper Shipping Name. This can be done by checking the dangerous goods list to see if the material is specifically listed, or you can refer to the material Safety Data Sheet to see if a PSN is listed under the shipping information section. The dangerous goods lists for all transport modes show particulars such as class, UN numbers, packing groups etc, and they also show an Excepted Quantities code (which always starts with the letter ‘E’). Once the Proper Shipping Name is known, the lists can be checked in the relevant modal requirements to ascertain the applicable ‘E’ code of the substance which denotes if the goods can be shipped under the LQ provision and at what weights. If code E0 is allocated, this means that the particular goods may not be offered as an EQ package. If a code between E1 and E5 is allocated, then the dangerous goods may be shipped, provided that the amounts per inner receptacle and total package do not exceed the amounts set out in the table below. Differences between the modes can be significant and those responsible for the marking and labelling of packages should understand the key differences. Packages for the Excepted Quantity provision must be ‘triple packaged’. They must consist of an inner packaging and an intermediate packaging which are both placed inside a strong rigid outer packaging. The inner packaging must be constructed of glass, porcelain, stoneware, earthenware, metal or plastic, and they must also be leak-proof and have secondary closures. 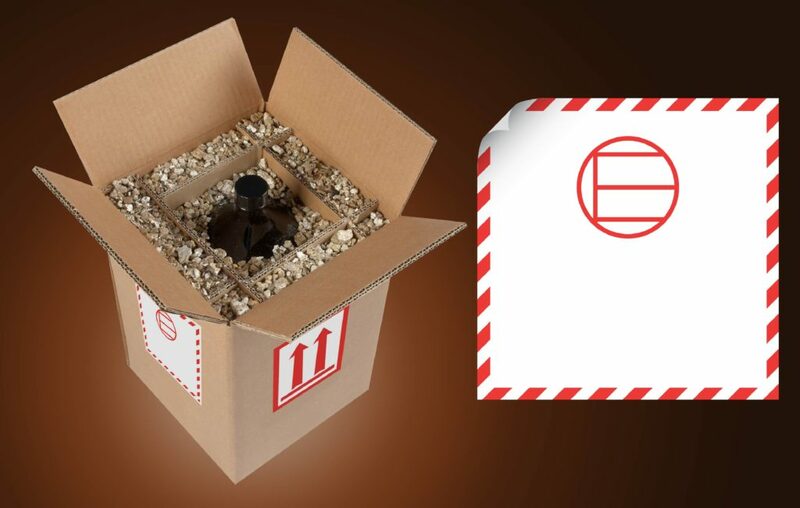 The inner packaging must be placed inside an intermediate packaging which has to have enough cushioning and absorbent material to soak up the whole contents of the package if it was to break or leak under normal conditions of transport (regardless of the package’s orientation). The intermediate packaging must be securely packed inside a strong rigid outer packaging of adequate size to apply all the necessary markings. The outer packaging does not have to be UN approved, but it does have to be drop tested and stack tested. The outer package of Excepted Quantities do not need to show hazard class labels, but they must be durably and legibly marked with the Excepted Quantities Label (Excepted Quantity Mark) as shown below. The Excepted Quantities Label, which was developed in the UK, must be a minimum of 100x100mm square. It must have a red (or black) hatched border on a contrasting (but not necessarily white) background and must show the extended ‘E’ (signifying Excepted) in a circle. 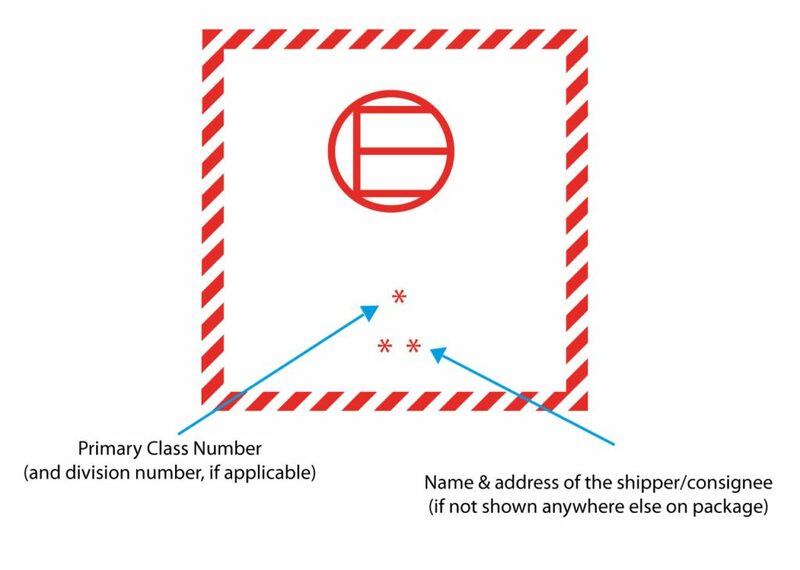 It must also show the Primary Class* (& division if applicable) of each of the dangerous goods contained in the package and the Shipper or Consignee’s name and address** if not shown elsewhere on the package. An overpack containing dangerous goods in Excepted Quantities must display the Excepted Quantities Label (as shown above) unless the markings on the individual packages in the overpack are clearly visible. A new sub-set of Excepted Quantity package provisions was introduced in January 2013. These stipulate that for certain goods in extremely small amounts (never exceeding 1ml or 1g) the packaged goods do not have to meet any other provisions of the modal requirements and may be shipped as unregulated goods. In order for goods to qualify for the de minimis provision, the maximum net quantity of material per inner packaging must be restricted to 1ml for liquids and gases and 1g for solids. The maximum net quantity per outer packaging must not exceed 100ml for liquids and gases or 100g for solids. If the goods are assigned code E1, E2, E4, or E5 and packaged following the same instructions as for Excepted Quantities, then shipping notes, hazard labels and emergency phone numbers are not required. The de minimis exception (which includes division 6.1 – toxins) is mainly used by the pharmaceutical industry to ship very small samples and trial quantities of dangerous substances. Hibiscus Plc has been providing regulatory advice and labelling solutions to dangerous goods retailers and wholesale chemical suppliers for over 35 years.